Cups, Goblets & Beakers. Plates, Trays & Dishes. Vases, Bowls & Centerpieces. Decanters, Jugs & Flasks. Desk & Writing Instruments. Photo Frames & Mirrors. Sugar Bowls, Casters & Tongs. Mustard, Salt & Pepper. Snuff Boxes & Vinaigrettes. 12 Silver Plated Golf Cocktail Picks Set. Height – 16.5cm / 6.5in. Pick’s length – 9cm / 3.54in. 84gr / 2.7oz. Comprising 12 metal cocktail picks with golf ball shaped terminals made of plastic, double pronged picks. The stand is set on a circular base, centered with a carrying handle topped with a white golf club Bakelite? Pasarel offers a diverse, quality selection of items from a wide variety of interests and periods. Ranging from jewelry to antiques, brand new to centuries old, we pride ourselves on having something for everyone. Our jewelry collection features our in-house jewelry designer, the renowned and acclaimed Billy Shmerling Sender. In addition we also carry numerous pieces of jewelry from different designers, brands and of various ages. The Judaica section is unparalleled in terms of quality and rarity. Located in Israel we have the added benefit of a close relationship with the Judaica world, providing access and insight only few are privy to. Whether you are a collector, dealer, enthusiast or simply a casual shopper, we are confident that you will find something to your liking in our collectible and silver sections. The eclectic collection will find common grounds with even the most unusual of interests. In the rare case you do not find what you seek, feel free to write us and inquire. We guarantee lightning speed replies and an attentive ear. Israeli buyers to pay the current 17% VAT. We guarantee the items we sell are as described. We do not take responsibility for any personal or third party losses. At Pasarel, we are committed to providing the best possible on-line shopping experience. That includes a guarantee of excellent customer care even after your order has been delivered. We encourage you to write to us if you have any questions, requests or suggestions. When inquiring regarding a specific item please include the item number in the subject line. 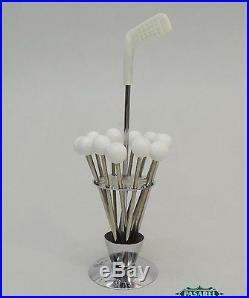 The item “Novelty Vintage Golf Interest 12 Cocktail / Martini / Olive Picks Set On Stand” is in sale since Sunday, February 8, 2015. This item is in the category “Collectibles\Barware\Other Barware”. The seller is “pasarel” and is located in Netnaya. This item can be shipped worldwide.